On Scene: Travel bags from TheFireStore! You may not think of TheFireStore as the place to buy great travel bags, but we like surprising people, and great travel bags we have! What our customers love is that the same great brands you love and trust for those tactical situations are the ones who make reliable travel gear. There's no need to draw the line in the sand anymore between work and play. Let the brands you trust be the ones carrying the possessions you care to protect as you travel. Brands like 5.11 Tactical, BlackHawk and True North are just a few offering bags big enough for you to travel with. Let's take a look at a few options, shall we? After years of faithful service the team at 5.11 Tactical redesigned the Mission Ready bag. Taking what they learned in the last few years they’ve made drastic improvements to the bag and its functionality. The Mission Ready 2.0 is made from 1680 and 1050 Denier Nylon and has heavy-duty oversized wheels and bottom skids along with rugged corner guards on all corners. Double self-retracting handles at each end allow you to quickly grab and go with your gear. The light colored interior improves visibility. The reinforced, rigid ends and bottom make this bag stable for standing on end, and the improved foot studs now offer lashing pass-throughs for strapping the bags down when palletized. The bag include lockable YKK zippers, name tapes, flag holders, markable write-bar name strips, business card holder and external document pocket. Available in 3 different color options, get your Mission Read Rolling Duffle, today. 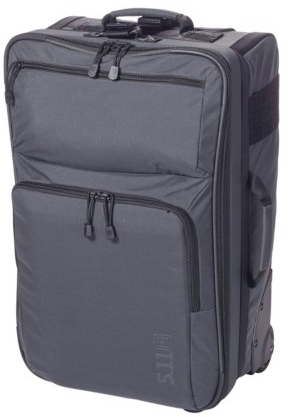 An integrated Rapid Excursion Pack provides second-stage grab-and-go travel capability, and zipper locks on the main and secondary compartments ensure privacy. The interior boasts dual web platforms for modular storage options and is completely encased in hypoallergenic foam padding. 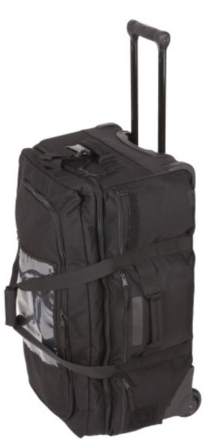 Additional features include a removable mesh toiletry bag, an insulated laptop sleeve, a rugged and durable multi-stage collapsing roll handle, and a heavy-duty all-terrain wheeled base. Hard corner protection and a moisture resistant finish keep your cargo snug and secure in any environment. Available in 2 different color options, get your DC FLT Line Bag here. 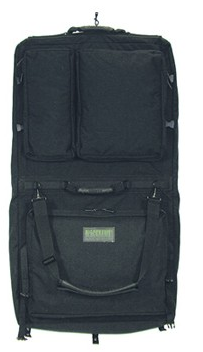 BlackHawk® has constructed the most sophisticated executive travel garment bag available. Hangers secured with adjustable slide lock. Super heavy-duty top & carry cross bars. Protective removable shoe pouch. Two outside pockets provided for separating clean and soiled clothing. Check out all our travel bags, including duffles, garment bags, rolling suitcases and more right here.